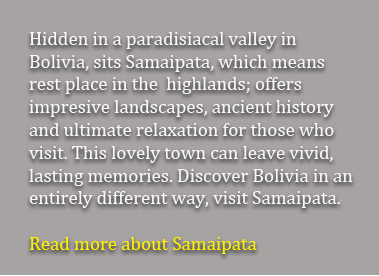 A beautiful photo gallery on Samaipata & its surroundings. Samaipata has very nice weather most of the year with temperature averaging 21º C.
• Art cinema on a big screen throughout the year. Lodging, Public services, Restaurants, Organic vegetables, Activities, Location & map, Emergency services, Flora & fauna, Spanish lessons, Press, Natural medicine, Weather, Links, Local events, Tickets to Sucre.